More presenters have been announced, and all have been slated into the jammed-packed schedule of VOICE 2008 - The VoiceOver International Creative Experience. 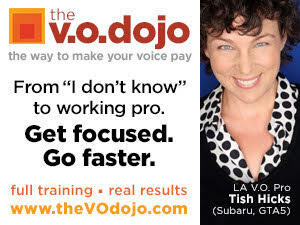 It’s the voice-over industry's second annual conference and exposition. This year’s event brings talent from many countries to the Hollywood area Aug. 8-11 (Friday to Monday), at the Hyatt Regency Century Plaza, on the Avenue of the Stars in Century City, Los Angeles. Actually, conference attendees should arrive a day early, Thursday, Aug. 7, to attend a Red Carpet Reception that evening from 6 to 8 p.m.
Friday, Saturday and Sunday mornings open with a General Session with four presentations, followed by networking breaks and time to visit the Exhibit Hall (see VoiceOverXtra.com!). There will also be evening sessions, and on Sunday night, the VOICE 2008 Celebrity Banquet featuring dinner (of course) and a Celebrity Tribute. There is an extra charge for this event. Monday morning wraps at 11 a.m. Check the show program for days and times of these presentations. $797 - after Aug. 1 and walk-ins. Day passes are not available. Hyatt Hotel: $169/night single; $199/night double. Parking: $20/day for overnight guests; $15/day for day visitors. To register, jump into the VOICE 2008 Forum and check the schedule, visit the web site: www.voice-international.com. Or contact info@voice-international.com.